As beautiful fall days go, it was hard to beat this Saturday’s homecoming game at Murray Goodman when it came to weather, atmosphere, or color. Unfortunately for Lehigh, it was also hard to beat the Fordham offense that showed up on homecoming in terms of physicalness, efficiency, and big play ability. The Mountain Hawks showed a lot of fight on Saturday, playing tough until the end against the No. 12-ranked Rams. But after Fordham surged to a two-score lead early in the game, Lehigh’s efforts to cut the deficit never really made it close, falling 48-27 in a career day for Fordham freshman RB Chase Edmonds. Though this game doesn’t officially count towards the Patriot League standings, make no mistake about how big this game is for both programs. Look no further than the ticket sales for this game. A sold-out, 7,000 seat venue for a meaningful football game is what FCS football is all about, and whatever happens it’s going to be a fantastic ambassador for Patriot League football broadcast across the country on CBS Sports Network. I honestly don’t know exactly why this quote from the cheese-fest-y move Clash of the Titans was the first thing to leap to mind when thinking about this weekend’s Lehigh/Fordham matchup. In the Patriot League, certainly, Lehigh and Fordham are the definition of Titans, both undefeated with the three best out-of-conference wins in the League this season. 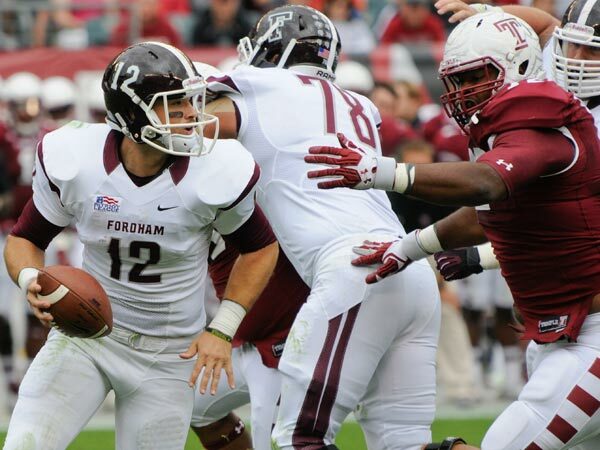 Two are owned by Fordham – they beat FBS Temple and nationally-ranked Villanova – and the other by Lehigh – their win last week over New Hampshire. In the FCS, too, you could define them as Titans in the sense that the Mountain Hawks and Rams are two of only twelve undefeated teams in the entire subdivision. Not all of these undefeated teams will be Titans at the end of the season, of course, but at least much of the national FCS community agrees for now that both are top teams: both are ranked in both major polls as two of the top 13 teams in the nation. So maybe a sub-headline for this game of “Lehigh vs. Fordham: Releasing the Kraken” might make a lot of sense. Because both teams won’t be holding back much in the game, which, as luck may have it, will be broadcast nationally on the CBS Sports Network at 12:00 PM on Saturday.